Fads, as is their nature, come and go, especially in the fickle world of fashion and this holds true in Mexico as it does throughout the rest of the world. 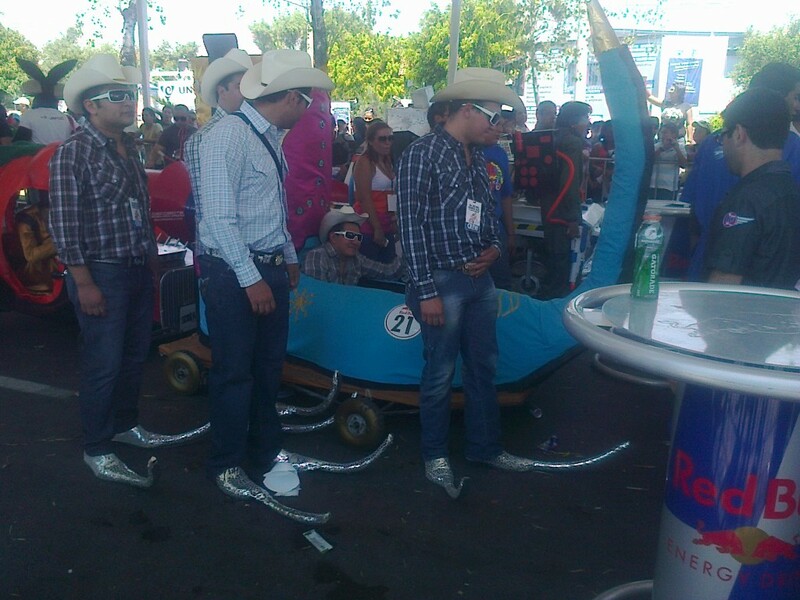 However, while at one point or another we were obsessed with diamantes, or trucker caps, the town of Matehuala, Mexico surely takes first prize for having one of the weirdest and arguably most inexplicable fashion fads of recent times; we’re of course talking about the impressively odd botas picudas, a.k.a. pointy boots. Have you ever been wearing a standard cowboy boot and thought to yourself, if only the toes of these were pointier? Well, neither have we. However, that seems to be precisely what happened in Matehuala, San Luis Potosí way back around 2008. It’s claimed that the man behind the bota picuda trend is a so-called Cesar de Huizache, and is from north-eastern Mexico. After commissioning a pair of extra-pointy boots, he shimmied on down to a local disco to try them out on the dance floor. While he disappeared from the scene, his footwear legacy most certainly did not. Popular with the predominantly youthful crowd of tribal guarachero fans (a musical and dance genre with a mixture of house music, cumbia rhythms and some pre-Hispanic influence), botas picudas have become a kind of cultural phenomenon, and were even the subject of a Vice documentary. 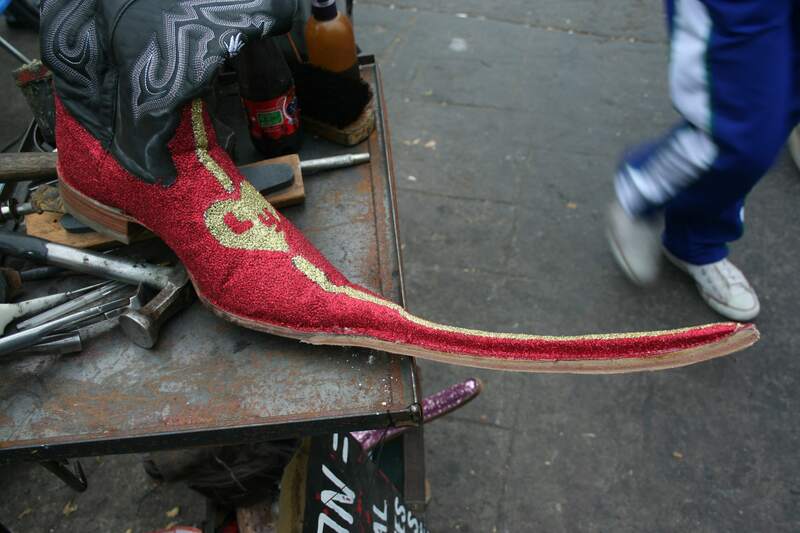 While tribal guarachero started life in Mexico City, it is far more popular in the northern states of Nuevo León and San Luis Potosí, and at one point or another tribal dance-offs started featuring more and more competitors sporting these impressively pointy shoes. In fact, at these dance contests, it isn’t uncommon to see prizes given to those in possession of the longest, pointiest, most intricately designed botas picudas, as well as for those with the best moves. The popularity of these dance troupes and their pointy boots has even led to them being hired to dance for quinceañeras or weddings and hen parties. Most botas picudas are actually just modified versions of standard cowboy boots, with the pointy tips added on and made from cheaply bought supplies, such as screws, foam spray and plastic. Additional embellishments such as glitter, sequins, flashing lights and decorations that err on the side of tacky are added afterwards. As such, each pair of botas picudas are notably unique and original. However, many places now make them in greater numbers to sell to would-be tribaleras, or fashion-conscious travelers keen to take home a piece of Matehuala. While most botas tribaleras are named as such for their link to the tribal genre measure in at around 2-3 feet, there have been pairs that are more than 5 feet in length and even some that require the wearer to literally attach them to their belt in order to walk and dance with relative ease. To say Mexicans don’t do things by halves would be an understatement. Furthermore, the typical styling of these boots is minimal, allowing the eclectically and heavily decorated footwear to take center stage – expect to see them worn with skinny jeans, checkered shirts and sombreros. While these botas picudas have been (perhaps understandably) widely derided in fashion circles both in Mexico and beyond, they boast an undeniable appeal and are the subject of much fascination. However, for those who create and wear them, botas picudas are a source of much pride. Whichever way you look at it, they’ve certainly developed a cult following and even crossed over into popular culture, making an appearance in 2010 on Glee and music videos for a handful of Mexican norteño groups. The trend even migrated north of the border into the U.S., growing in popularity in states, such as Texas, where there are many Matehualan immigrants.